A key UC regents committee moved Wednesday to hike tuition by as much as 28% over the next five years despite strong opposition from the governor, legislative leaders and students. University of California campuses up and down the state exploded yesterday, Nov. 18th, as students protested a devastating tuition hike proposed by the UC administration. Protests included a sit-in in front of the main library at UC San Diego – plus demonstrations at UC Berkeley, Irvine, Davis, LA. The UC Regents meet today – Wednesday – to discuss and possibly vote on the issue. In the meantime, Governor Brown has come out dead set against the hike. The actions by the students on Tuesday were in response to UC President Janet Napolitano’s proposed Long-Term Stability Plan, that calls for a 5% increase in tuition fees every year for the next five years – which would apply to all UC undergraduate and graduate students. It’s estimated that the hike would raises tuition to $15,564 by 2019-20 – compared to what students pay now – $12,192). The hike is opposed by associated student bodies at the UC campuses, by professors, by campus unions – such as Federation of State, County and Municipal Employees Local 3299. However, the UC chancellors expressed their full support of the Plan. Yet, according to the California Master Plan for Higher Education from 1960, higher education should be free for all in-state residents, according to the California Aggie. By increasing the fees for enrollment, more and more California students will be prevented from attending the UC system. Today, the UC Board of Regents meet at the UC San Francisco Mission Bay Campus – and students from all the UC campuses are expected to attend and demonstrate. Students from campuses including UC San Diego, UC Santa Cruz, UC Davis, UCLA, UC Irvine, UC Berkeley vand UC Riverside plan to attend. 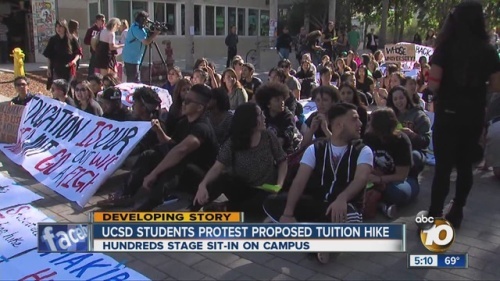 At UC San Diego yesterday, students held a sit-in in front of Geisel Library, in what the students called “Day of Action Against the UC Tuition Plan”. UCSD student Anali Valdez said that if the increase is approved, it would mean a 287 percent tuition increase between 2002 and 2020. “That’s insane,” she told Fox 5. About 400 UC San Diego students marched and held a rally on campus Tuesday in protest of proposed tuition increased scheduled to go before the UC regents Wednesday. “It’s a beautiful day for a student uprising,” UCSD professor Jorge Mariscal told the crowd sitting on Library Walk outside the Geisel Library shortly after noon. Earlier in the day, students marched on campus with signs that read “Freeze the tuition now,” “Take a hike, UC Regents” and other slogans in protest of a tuition increase that could cost students an extra $600 next year. At UC Davis, on the anniversary of the infamous pepper-spray incident, hundreds of students held a raucous march and rally. A group of about 50 student protestors filed into UC Riverside’s administration building Tuesday afternoon and occupied its fourth-floor hallway outside Chancellor Kim Wilcox’ office. Snappy chants, colorful posters and expletive-laced chalk messages mixed with collegiate zeal Tuesday afternoon as 150-plus students protested a proposed tuition hike at UC Irvine’s administration building. As someone paying full freight for my son’s Berkeley education, I am sympathetic towards the students. But these students need to be in Sacramento to confront the Democrats that are not supporting the UC. And Brown who supports bullet trains in the desert before funding for education has a lot of nerve to comment on the tuition hikes, IMO. 2) Out of State Tuition shall cover the full cost of education for 2. This would mean no State money is used to cover out of state (or country) students. 3) If you start any college course and drop it- you must pay the full cost of the course before you are allowed to take another course. (Community College students- I’m looking at you).